The new site is unluckily not working for me: most of time it doesn’t load, I can’t find the search bar and the login page, plus I did not receive the email to reset my password (but I read somewhere else I should). Is it normal because it’s all about the first moments the new website is online or can I fix those issues? Thanks! I'm finding it a bit of a nightmare tbh. It seems slower than the old site, and everything is too big - keep having to scroll up and down to see all the details of anything, whereas before you could see a whole season, or all the details of an episode, on one screen. I occasionally add new episodes to the database, but I don't know if I'll have the patience to keep doing it on this new site. Too much extra clicking required. That launch was... sudden . It will certainly speed up in a bit I guess. Loads of data to cache. Already gotten my first timeouts tho . You can do a PW reset manually btw. To be very honest I would not consider this a successful roll out here is why. However it does work on Chrome on my mobile device but you have to switch to request a desktop version to get the menu bars. I know you are doing all you can and I also have come to realize how many people, organizations and other products rely on your website. as far as I can tell, there's no "all episodes" page anymore, this is awful. I clicked Forgot Password, reset it. Received the Email. Clicked the link. Created new password. 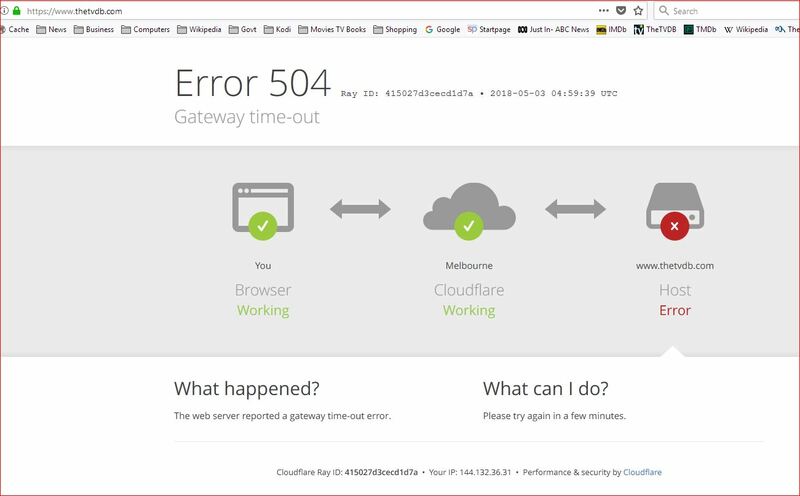 Attempt to login and all I get is a Cloudflare issue or the page just simply reloads back at the Login page. As a viewer I think the new site looks better, but as an editor like me it's a nightmare like some of you have mentioned. I don't know how many people visiting the site would only browse, this is supposed to be a database to support 3rd program like Plex or Video Station from Synology. The site should be made editor friendly like how it was before. give it a try... i´m also editing a lot. when i saw the site first a while back ago i also thought.... "wow, ok...", now it´s there. be patient when everything is working (at my first try´s i couldn´t add an episode thumbnail, editing an actor and add some details have worked) and then try again. my only problem at this time is that my tool (mediaelch) dont find any infos, or the show itself. hopefully this will work soon.